A completely customizable double-sided Sweetheart wedding program fan that will be 5.5" x 6.5" (plus a 3" handle). You can have anything you like written in the heart and on the back! Change any or all of the wording to suit your special day. If you are looking for something simple and sweet, this is it. 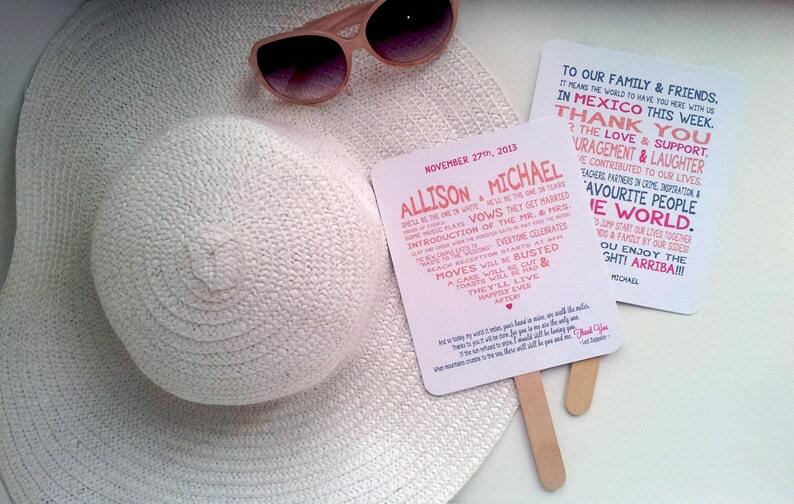 Your guests will enjoy reading through this fun Sweetheart program, and cool down in the hot weather. Please note this is a Ready-to-DIY Kit. - After you approve the design I will print on cardstock, cut and score the paper for you (scoring gives you a nicer crease when folding in half). - I will mail you these prints along with the fan handle sticks. - So all you have to do is glue the stick on and glue both sides together. You'd have to purchase an adhesive separately (double-sided scrapbooking adhesive will work nicely). - Rounding the corners after would be optional, you can buy a corner punch at the craft store. ** If you are only looking for me to do the design and you print and make your own, please visit the Printables section of my shop. Prices are in the drop down menu according to quantity. Minimum order is 30 pcs and are available in tens. If you require more than 200 please Convo me for a custom listing. Full design process including complimentary rounds of edits. Pre-printed card stock (199 gsm / 80lb. acid free card stock) that are pre-cut and scored so they are ready for easy folding, plus wooden fan sticks. I will provide instructions on how do put your fans together, it is an easy 3 step process. Package will arrive carefully wrapped in a layer of tissue paper, then a layer of clear cellophane for extra weather protection during shipping in a cardboard box. After payment and your details are received I will deliver a digital file for your proofing within 3-4 business days (please message with special rush requests, it is possible!). You receive up to 2 complimentary edits and I will resend your proof within 24hrs of your edit requests. After you approve the design, I will dispatch the kit within 4-5 business days FROM THE DAY you approve the final proof. If you require a quicker turnaround please message me, it is most often possible but you just have to check with me first.